Hello everybody, I know you're out there. Friends have tried to comment on my blog, but I'm still not receiving any comments, good or bad, except a couple of tests I sent myself. If anyone stumbles across my blog who is knowledgeable, can get through, and knows what is going on. I'd really appreciate your help. Also, I was not asked to moderate the test comments I did, although I have that option checked. More art tomorrow. I have painted this scene many times. 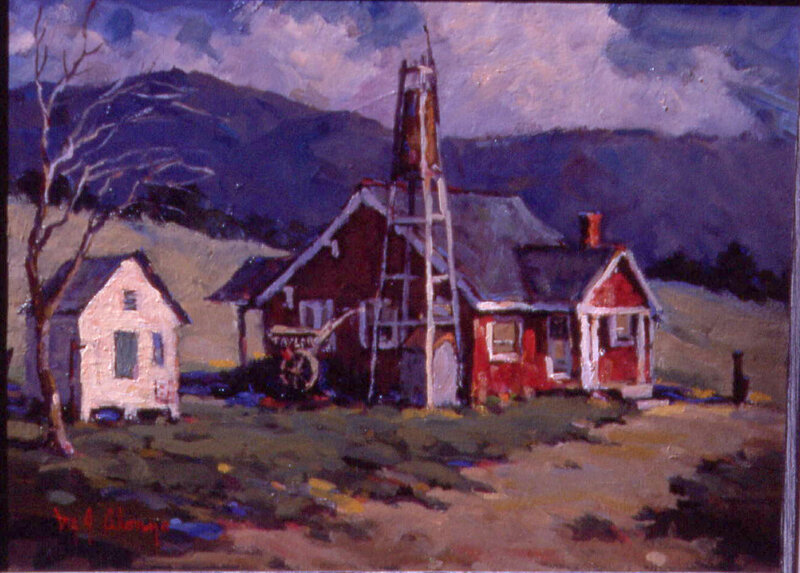 It is an old farmhouse that has now been converted to a bed and breakfast, and the owners are very nice people who welcome artists. In addition to the bed and breakfast operation, there are still persimmon trees and other crops growing on the property The road is one of the many beautiful country roads on California's Central coast. 8"x10" Oil on linen panel. For a long time, I was lucky enough to be a good friend to a wonderful artist and gentleman, George Gibson. 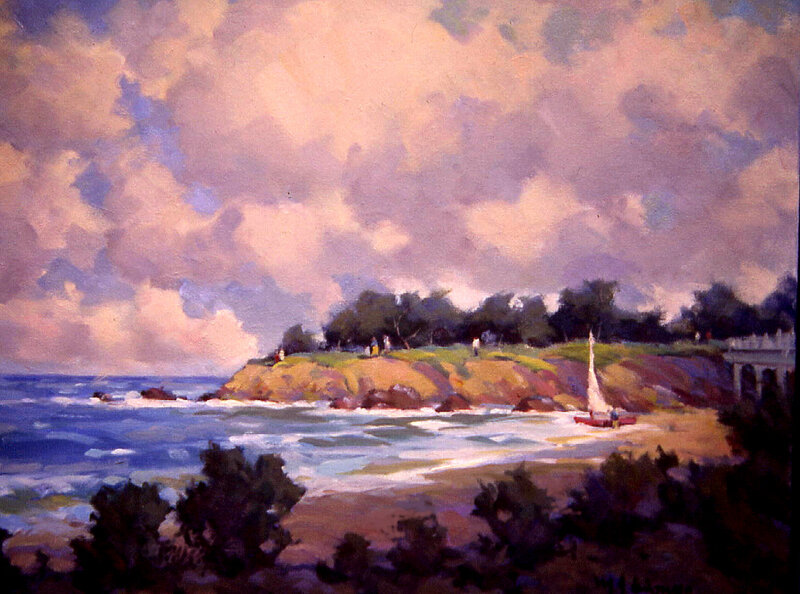 He was one of the famed early California watercolorists and the retired art director of MGM studios. 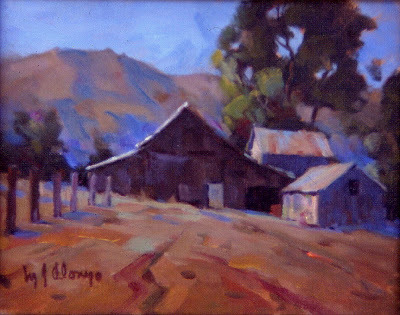 George and I painted together for quite awhile until his death a few years back at the age of 96, and he will always be remembered fondly. 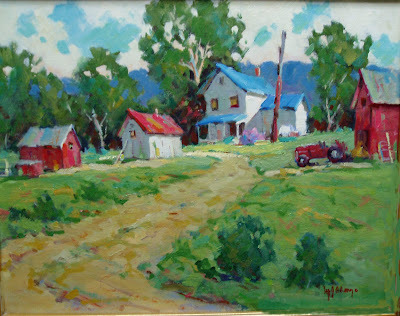 The painting's name reminds me that this is the scene he and I painted the last time I painted with him. ﻿Thought I'd throw in a picture of the California group I have mentioned. I've painted with them for almost thirty years. At first, there were only four of us, but over the years it has grown considerably. Happily, the local farmers, ranchers and landowners all know of the group and allow us on their property. 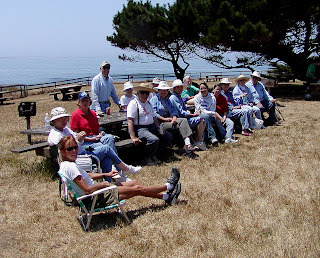 We were having our lunch and critique on the picnic grounds of Leffingwell Landing, the subject of my June 9th posting, a popular park and picnic area. 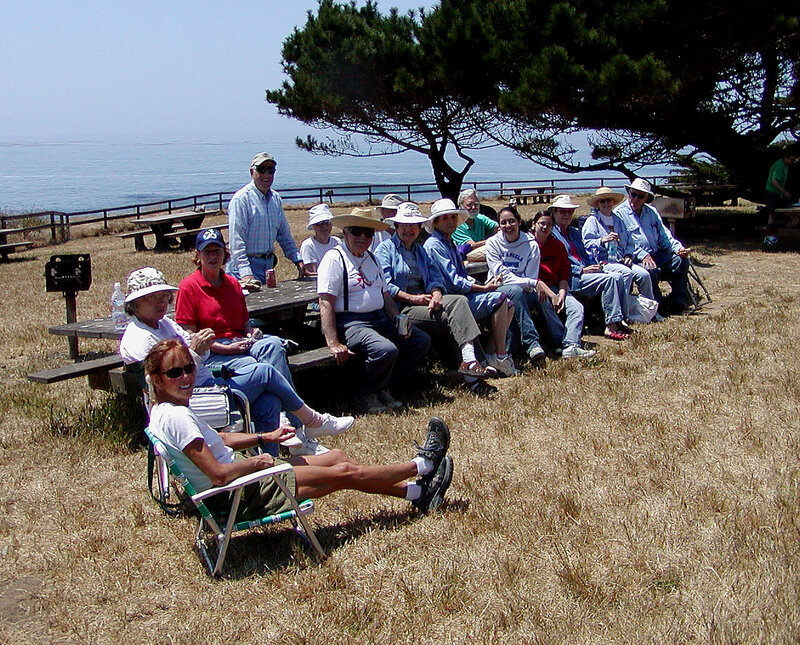 The nominal founder of the group, Art, is in the green shirt sitting quietly in the back row. Unusual---- he's almost always in front critiquing or being heckled. Hee Hee! I still don't have "Comments" set up on this blog, but I will have by tomorrow, if all goes well. 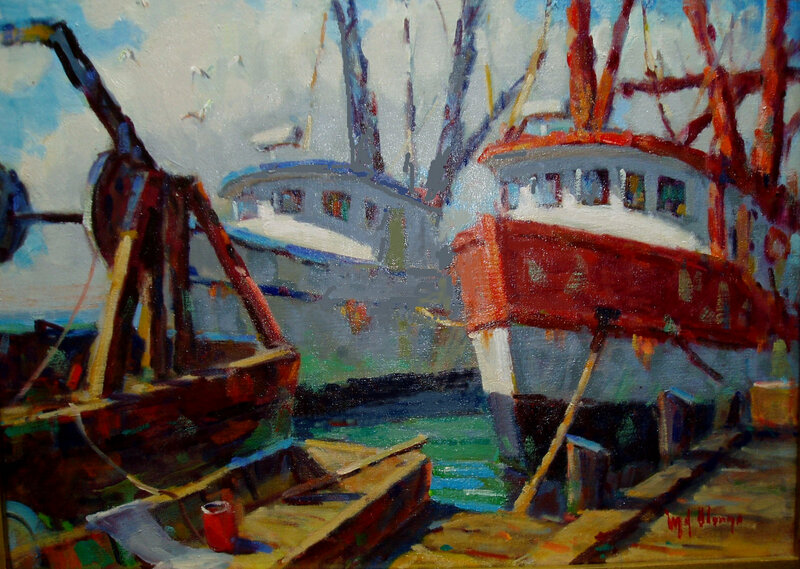 The fishing industry in the USA is in dire straits, and the title of this painting, unfortunately, is no longer true. These two boats, once working full time, are gone, as are many others. One of the two above was junked, the other I have heard is being converted to a Sea Scout vessel, but is no longer in Morro Bay. 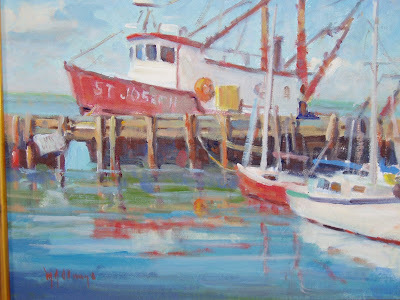 I painted the red,white and black one many times (it's the subject of my first post on this blog). I have many photos of these boats, so I'll be doing them again, occasionally. It was nicer doing them in plein air, though. 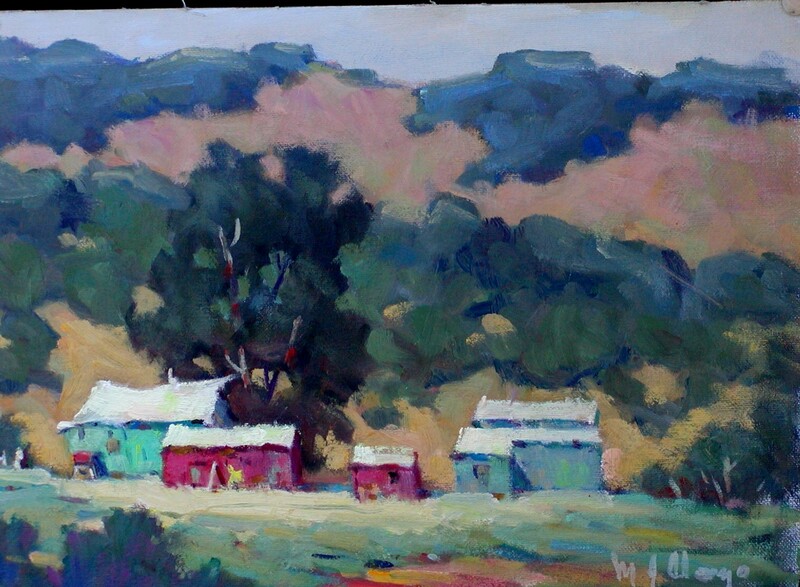 This was done a while back on one of my return trips to my old home grounds on California's central coast. It is a beautiful area with great subject matter everywhere. I miss it. Every year I try to get back there for a month or so. There are many outstanding artists there, some of whom are good friends of mine and we always get out as much as we can during my visits. 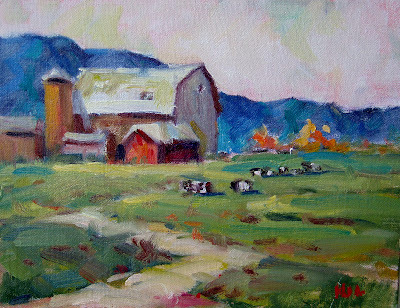 The scene above is an old farm just off the major valley road, and I have painted it many times. On that day an overcast sky was breaking up and the sun caused cast shadows to appear. Ah Yes! I remember it well. (Apologies to M. Chevalier). 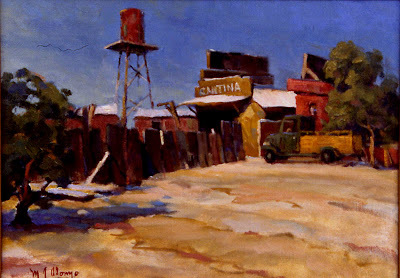 A large studio painting done from a small plein air study. 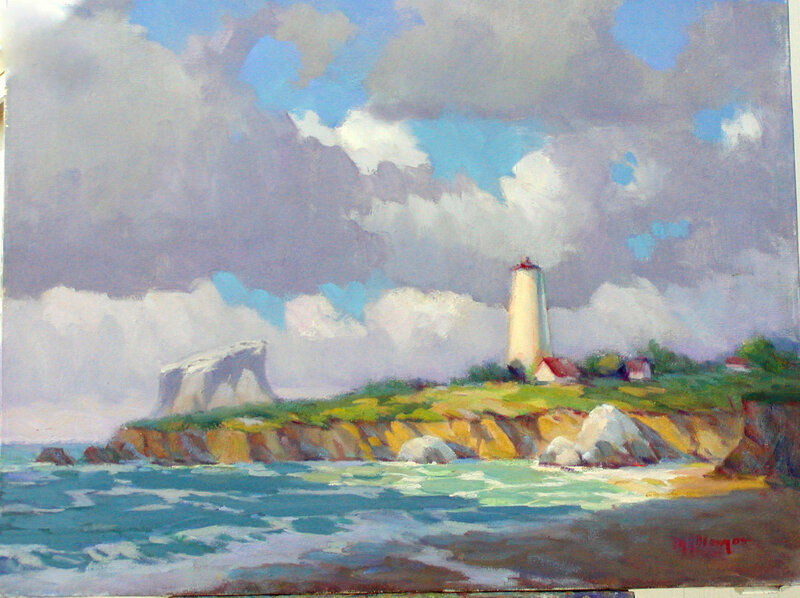 The title (the name of the lighthouse) refers to the large rocks made white by bird droppings. Painting this spot is a challenge because the large rock behind the peninsula fights with the lighthouse for center of interest. I tried to mitigate this by making the lighthouse really bright. Still not sure if it worked. The lighthouse is located on California's central coast. Incidentally, there used to be a glass covering on top of the structure, sheltering a large fresnel lens. When the operation was automated, the lens was removed and can now be seen in the center of the little town of Cambria. Hello again! I am slooowly making headway in my battle to get my blog going. On my first attempt the post date was not correct and I think I can get that right next time. I don't have email set up yet, but am working on it. By the time the "Daily Paintworks" auction site is ready for new members, I should be ready to get into action. 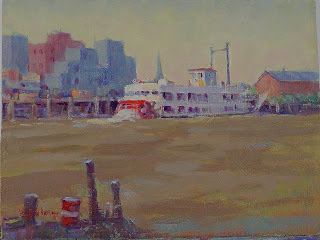 Until then, I will continue to show a sampling of my work which has already sold. The one above was done a while back somewhere around Meridian Miss. The lady was actually hanging laundry, and the setting was almost like a movie set. 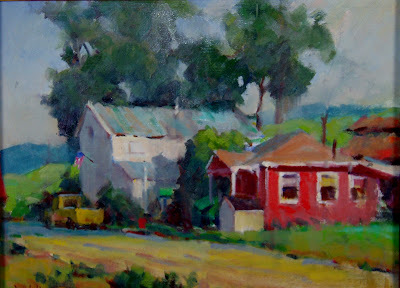 I asked her permission to paint her and her home and she gave me a smiling OK and then a very nice critique. Said she liked it a lot. Hope you do.too. This is my first attempt at blogging, and I hope you all will be tolerant. I'm floundering. For example, I think my self photo is embarrassingly large, but, at this point I don't see a way to reduce it. Ah Well! Thats a minor problem, I'll live with it. Then, there's email problems I don't yet understand, text columns that realign themselves--Argh! Anyway, the painting above ( At least, I hope it will be above! ) was done in Morro Bay, Cal. near where I lived until very recently. 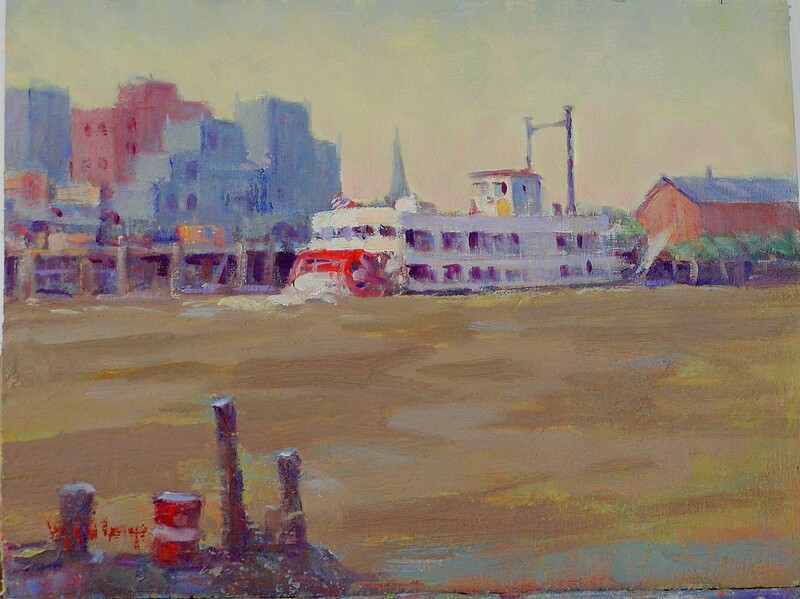 The title was prompted by the old fishing boat in the background with the pleasure boats in front. As indicated, it has already been sold.